It is in that context that I have recently noticed an increase in press coverage around the debate as to whether we should allow (or not) phones in schools. 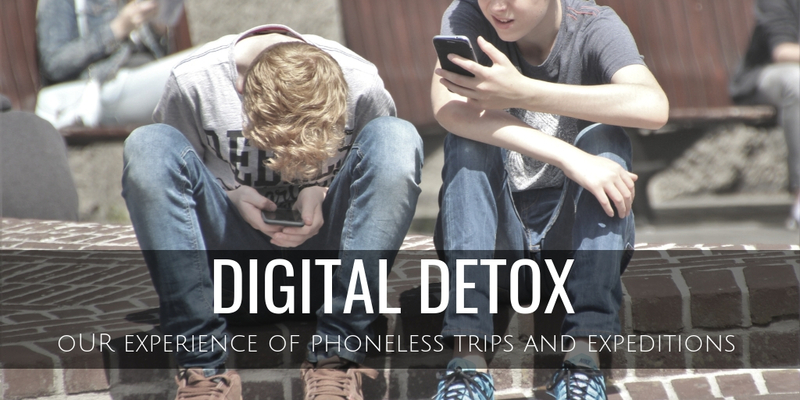 I have certainly heard the concerns of parents and teachers that young people are too dependent on their smartphones, that phones have become a contributor to their worries and stresses, or worse that they are simply addictive. This, balanced against the enormous technological and communication benefits that phones and tablets offer, make it a complex argument. What is really interesting is that, actually, 90% of our expeditions opt to have a no phone policy on their trips. Ultimately, this has to be the decision of the school, students and parents and it is probably the thing that sparks the most debate when we initially meet with everyone. Most of the schools that we work with already have restrictive phone policies of one kind or another. For students and parents, in particular though, it can be a tricky thought process to navigate. To most, whilst the benefits of unplugging do seem obvious and attractive, the reality of being without day to day contact for a few weeks is something that they have simply never experienced and that can feel worrying. For us, the experience of phone (and often screen) free expeditions have been almost entirely positive. We think that the benefits of unplugging for a two to four weeks definitely outweigh any negatives. In fact, our experience is that it is nothing short of liberating. · It helps to build groups and relationships. We all know that it is a real pleasure to receive somebodies undivided attention. Having a whole group of people who are focused on each other and the immediate environment is a wonderful (and unusual) thing and really speeds up the process of team-building. It is amazing, the conversations that people have when they are on a bus for 3 hours with nothing to distract their attention. Those conversations are frequently some of the most important chats that they may have on the whole expedition in terms of building relationships. · Homesickness is actually easier to deal with. Homesickness isn’t really about missing home, or even loved ones. It’s about missing the familiar, the safe, the predictable elements of life at home. So, too much focus on what is happening at home doesn’t allow students to get used to their current circumstances. It rarely helps. Ultimately, we need to give students confidence that they can overcome homesickness themselves so that, when they do, they can give themselves the full credit for that. By its nature, an expedition is a challenge. An adventure where leadership, team-building, and resilience are sometimes tested. Of course, it’s a big learning curve. But, for students, knowing that they have managed all of this without parental reassurance for 2-4 weeks is a huge confidence boost. · It allows everyone to really engage with their surroundings. The things that makes travel such an enriching experience are often small. Conversations, observations, sounds, smells, places and people that you can only notice if you are present in the moment. · The trip becomes about doing rather than documenting. It is amazing, when you take away the pressure of creating the perfect Instagram shot or selfie, you can just focus on doing. Students often say that they enjoy the freedom of not worrying what they look like and that moving the focus from appearance onto the ‘real world now’ is a really positive and liberating experience. We all know that teenagers need a lot of sleep. The demands of physical challenge mean that on expedition we find this is even more critical. Without devices we find that bedtime is just that. A time to rest for the next day’s challenges. Just to make it clear, the expedition leader is not unplugged! He carries sophisticated GPS tracking and a satellite phone that means that we can always be in contact. For students though, we find that without the perceived security of their phone they make better, safer decisions. They meet up when they say, they stick to their groups, and there is definitely no temptation to get distracted at the wrong moment by that unexpected text or tweet. It is a powerful thing for any of us to know that we are able to digitally switch off, that nothing terrible happens when you do, and that it fact it can be a very positive thing.